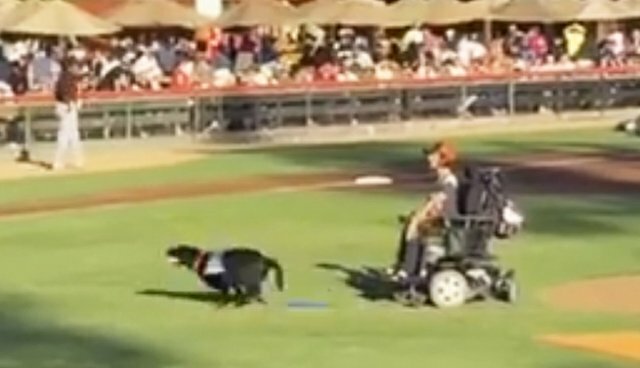 Folks in attendance at a recent San Jose Giants game in California weren't just treated to a day of baseball - they got to see the love of a loyal pup, too. On hand to toss out the ceremonial opening pitch was Giants fan Jeanette Kaliska, but she did it more adorably than most. Kaliska, a local school teacher, has spinal muscular atrophy which makes it difficult to complete such an activity alone. Not to worry though - she brought along her faithful service dog, Thelma, to help her to "throw" the ball perfectly over home plate. Of course, Thelma's role in Kaliska's life extends far beyond sports. The friendly pup, trained by the nonprofit Canine Companions for Independence, is one of countless service animals working every day to help make their owners' lives a little easier. Most will never hear cheers from a crowded grandstand, but we're rooting for them all the same. Click here to find out how you can help service dogs like Thelma reach their full potential.